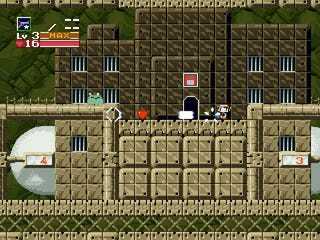 Cave Story evokes nostalgia, which is weird, considering that the game is only four years old. The pixilated graphics and action/adventure style of gameplay are supposed to remind you of a simpler time when the only ways to go were left, right, up or down – and you started your quest with just one gun and three hearts. At first, I mistook it for something my teenage babysitter used to play to entertain me when I was a kid (his favorite was Bonk’s Adventure, mine was Metroid). But after listening to the demo handler discuss the details – especially the part about how hands-on the Japanese creator is with this WiiWare version – I got my story straight and started looking for reasons why gamers would want to regress to this kind of gameplay.The thing I noticed right away was the story. It was surprisingly deep, well-written, and it moved damn quick. At the end of the first area, I came to a village of rabbit people arguing about what to do with an evil doctor and a chick that kept herself locked away in a room. There was also a short, creepy scene with a guy at a computer terminal running out of food and pleading for his sister to come save him. Heavy stuff. I met the first boss in the rabbit village – a dude who can best be described as a suitcase. His co-minion (a chick), made off with one of the rabbit girls and he was left behind to deal with me. He asked if I wanted to fight, and I said no. And he left. I did a double take. I just talked my way out of a boss fight. That’s not something I remember doing in Castlevania or Contra, or any other old game that Cave Story seems to be emulating. Everything else feels familiar, though. The enemies, the sprites and the backgrounds all have a retro, pixilated feel to it (although the game has gotten a full graphical overhaul for the Wii). You start out without being able to shoot anything, and then you find a gun and level it up so you can shoot bigger and better kinds of blasts. When you go under water, you have an air gauge of 100 that refills when you come up for air. You also find keys and access cards and heart containers to expand your life. The save points are little floppy disks (remember those? ), and the entire thing will support the Classic Controller – so you can pretend you’re playing a SNES while pretending you’re playing a twenty year old game. Overall, I really liked Cave Story. You can tell that a lot of thought, time and energy went into making it and even if you’ve never playing any game in your life that would lend it some kind of nostalgia, it just feels fun to play. Can you really ask for more from a WiiWare title? Cave Story should be out in time for the holidays, unless something horrible happens and the push it to early January.